If dental hygiene isn't high on your priorities, don't worry: now you can just print a new set of teeth. Last year, an 83-year-old woman had her entire lower jaw replaced with a 3D printed replica. 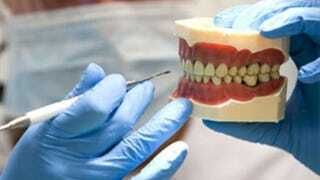 The surgery, carried out by doctors from the University of Hasselt, Belgium, saw them replace the woman's original, badly infected jaw with a 3D-printed titanium and bioceramic version. The 3D printer in question uses laser sintering, where layers of titanium are built up and a laser used to fuse the correct particles together. The whole thing was coated in ceramic to make it compatible with bodily tissue. It weighs 3.7oz — just 1oz heavier than a real lower jaw. Jaw replacement isn't a pleasant experience, and given the age of the patient, conventional surgery was considered too risky — hence the experiment with 3D printing. It seems the operation was a success: one day after the procedure, the lady could start talking and swallowing.